“Despite these challenges, entries ranged from locally manufactured stainless steel corrugated pipes to world-class architectural masterpieces to feats of engineering and inspiring stories of transformation and growth amongst our members”. Ten judges spent an entire day pouring over the entries taking time to analyse each one and were very pleased with the locally originated nature of the submissions. The judges felt the overall winner ND Engineering was consistently impressive with a variety of projects in a number of different categories. 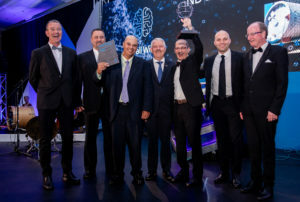 As a result, not only did it achieve winner status in the Manufacturing Innovation and Duplex Stainless Steel categories but also first runner up in the Welding category and merit awards in both the Export and Agro-Processing categories. ND Engineering MD Elvis Green comments; “Over the last two years, we have chosen to be mindful of the external factors that have plagued our industry but to also actively focus on internal improvements to negate the affects. To counteract this, we have invested in new equipment and most importantly, we have created a stable environment in which all team members are comfortable and able to express themselves, without having to shoulder the burden of these tough economic times. A new addition to the awards was the Most Transformed Category which pays homage to those companies that have embraced change within their business structures. Looking at winner Sky Hill Heavy Engineering, the judges commented; “Through training and equity partnerships, the company has transformed from a Level 5 B-BBEE company against the new codes in 2016/2017 to a Level 1 B-BBEE company today. Black females now own 30% and black males 21% of the company. The company is indeed transformed and has achieved this very rapidly”.